CINEMAGOERS WILL BE given a rare chance to see “real Arab life” at the inaugural Dublin Arab Film Festival (DAFF) this week, according to festival director Zhara Moufid. The Moroccan-born filmmaker and actress said the event will allow Irish people to see that “Arab people are the same as western people”. DAFF will run at the Light House Cinema in Smithfield from Thursday, 8 May to Sunday, 11 May. The four-day festival will showcase new and old feature films from North Africa and the Middle East. We want people to know about the Arabic people. We want people to know about the Arab culture and the real Arab life. I think in the west the Arab culture is shown in another way … it’s a negative portrayal. Moufid said she was approached by Irish filmmaker Jim Sheridan to help set up the festival after he grew frustrated by the “injustice” shown to Arab people in cinema. The only roles they can play are terrorists. 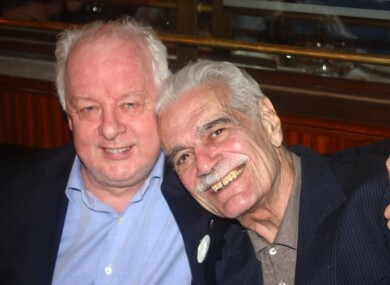 In a recent interview with the Guardian, Sheridan recalled his late friend Marlon Brando saying there will “never be another Omar Sharif” following the 9/11 attacks in New York. Moufid said DAFF would provide “a good opportunity” to change this. ”There are great Arab actors that nobody knows about,” she added. Two additional screenings - Lawrence of Arabia and The Jacoubian Building – will be held at the Chester Beatty Library on 10 and 11 May. Speaking at the launch of DAFF last month, Sheridan noted that the festival coincides with “the first really good year for Arab cinema worldwide,” with three Arab films nominated in separate categories at this year’s Oscars. “I think we’re coming in at the right time. It’s not a political thing, they’re just the best films out there,” Sheridan added. Moufid has lived in Dublin for 14 years. She studied film production at UCD, before doing an MA in media and journalism at Griffith College. “I love Irish people and I fell in love with Ireland,” she explained. She said she hopes DAFF will become an annual event. Screen legend Omar Sharif has proven to be a major draw for the festival – a Q & A session with the Egyptian actor on the opening night has already sold out. Sharif, who has starred in classic films such as Lawrence of Arabia, Doctor Zhivago and Funny Girl, will attend a screening of his Golden Globe-nominated 2003 film Monsieur Ibrahim. Tickets are still available for most of the other screenings. The Oscar-nominated film Omar will close the festival on 11 May. Its director, Hany Abu-Assad will attend the screening. The film, a love story set in the Palestinian territories, was nominated for the Best Foreign Language Film at the Academy Awards earlier this year. It won a jury prize at Cannes and was also selected to be shown at the Toronto and New York film festivals. Other attendees at DAFF will include Egyptian director Ahmad Abdallah, Lockerbie campaigner Dr Jim Swire and Haifaa Al Mansour, the first woman from Saudi Arabia to direct a feature film, Wadjda - which was nominated for a BAFTA this year. Email “'The only roles they can play are terrorists': New film festival challenges Arab stereotypes”. Feedback on “'The only roles they can play are terrorists': New film festival challenges Arab stereotypes”.